BEFORE: A vehicle impact on residential street, London. A roadwork construction vehicle damaged an overhead hydro line to a residential property. The call out came in on a balmy summer’s evening. AFTER: The work that was completed that same evening to make the property safe and resume power for the homeowners. 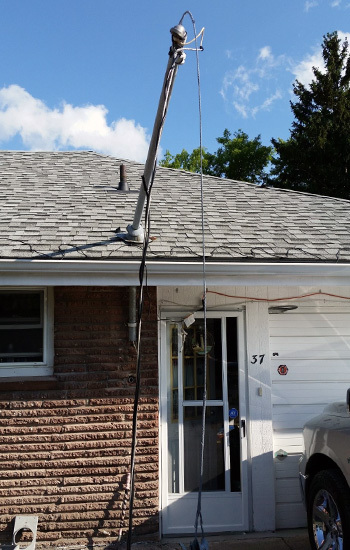 At the time of this after hours emergency call, it was found that the 100 amp, overhead service could not be reused as it was damaged beyond repair by the vehicle impact. PTN Electrical arranged after hours ESA inspection to have the power restored upon the completion of work, as well as liaising with London Hydro. Due to the time of the call out, the wholesale suppliers were not available to source materials, but this highlights how well stocked the PTN trucks are with a variety of materials that allow the majority of emergency calls out to be serviced so efficiently and in a timely manner. 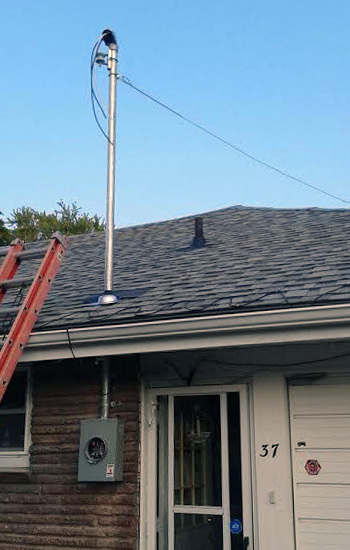 The vehicle-damaged, service mast and meter base was disconnected and removed and a new replacement mast, meter base, guy wire, and service entry conductors were installed. Once all final connections were made, the ESA inspection took place later that evening and London Hydro were able to resume power to the homeowners around 11pm. This was another successful emergency call out service by the PTN team with some very happy homeowners that were able to stay home that night with their pets.